handheld tachometer for measuring rotations with or without contact to the rotating piece. also it is able to hold the min., max. and last values in the integrated memory. The handheld tachometer PCE-T236 is for measuring velocity either optically or by contact. This handheld tachometer determines the rotations of machine components, conveyor belts, motor parts, rotating components, etc. Non-contact measurement is done with this handhald tachometer and the help of reflective tape that can be stucked to the rotating piece. While contact measurements are done using different mechanical adaptors or wheel adaptors that come with the handheld tachometer in England (see the photo of the hand held tachometer). The tachometer PCE-T236 is powered by batteries which are easy to change if they are empty. 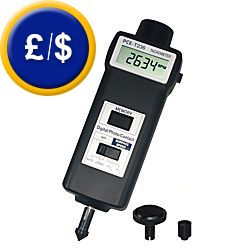 The advantage of the handheld tachometer PCE-T236 which we supply in England / the UK over Stroboscopes is the exact contact measuring which is used to get values with the highest accurancy available, The tachometer has a switch for selecting the measurement range and memory for last, maximum and minimum values. It (the handheld tachometer) comes ready to use straight out of the box which includes a carrying case, measuring wheel and batteries. The effort of this handheld tachometer is very high and the measurment of the rotating pieces is very accurate with this handheld tachometer. If you are looking for a handheld tachometer with similar technical specifications in the UK which is also capable of contact and non-contact measurements and comes with an OSENP optical sensor, click here. If there are any questions about this handheld tachometer PCE-T236, please have a look at the technical specification below or call: UK customers +44(0) 23 809 870 30 / US customers +1-410-387-7703. Our engineers and technicians will gladly advise you regarding the tachometers or any other products in terms of regulation and control, or scales and balances of PCE Instruments. Note: Before using the tachometer, read the user's manual on how to take an optical measurement or a contact measurement with the PCE-T236 tachometer. Measurement by contact of a packing line using the handheld tachometer PCE-T236. Optical measurement of a packing line with the PCE-T236 tachometer.